> Age from 18 years not exceeding 25 years. > Minimum 1 years of experience in Microfinance sector or related. > Age not exceeding 30 Years. > Minimum 2 years of experience in bank and financial institutions or Microfinance sector and currently working one level below from applied position as a Branch Manager. > Minimum Qualification- Masters Degree in management or equivalent. > Minimum 4 years of working experience in managerial level in microfinance sector and currently working as a senior manager. > Knowledge in Short Term/Long Term Planning, Business Expansion Strategy, Quality Assurance, Public Relation, Team Building. 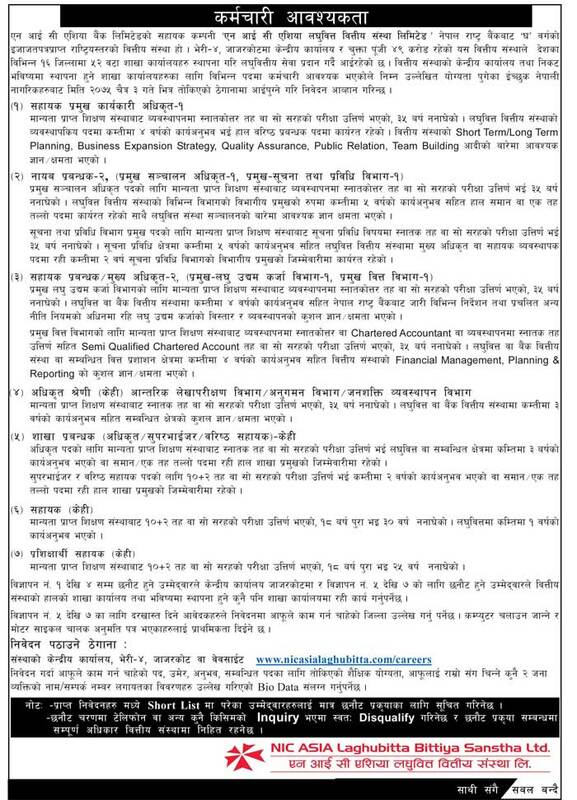 > Minimum 5 years of working experience in different department of microfinance sector as department head and currently working in one level below position from applied position. > Minimum 5 years of working experience in IT sector and 2 year of working experience in IT department as department head of microfinance and currently working as chief officer or Assistant Manager. > Knowledge in collateral loan and other financial regulations and directives issued by NRB. > Minimum Qualification- Masters Degree in Management or equivalent or Chartered Accountants or Bachelors Degree with Semi Qualified Chartered Accountants. > Knowledge in Financial Management, Planning and Reporting.